Kalalau Valley lookout on Kauai. Many people worldwide have interests in taking Kauai vacations. If you’re one of them, this information may be helpful to you. Because of its greenery, people know Kauai as the Garden Isle. The island is also famous for its beautiful white-sand beaches, spectacular ocean cliffs and breathtaking hiking trails. Kauai hosts the popular Kauai Mokihana Festival. It’s also home to the Hawaii International Film Festival and its own unique version of the May Day or Lei Day event. The town of Waimea stages many of these festivals and celebrations. Such events include a popular ten week long song fest in February and the Waimea Town Celebration featuring an outrigger canoe race. Kauai has many small towns with deep historical significance. The island has ancient artifacts dating back to the first century. 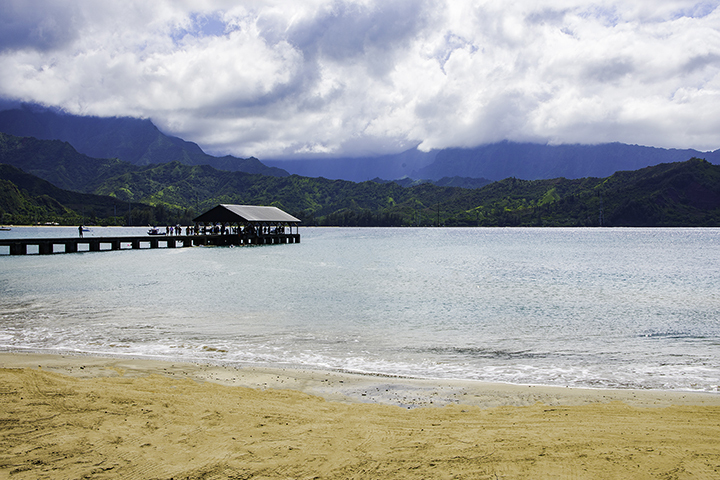 Many recognize Kauai as being the most history-rich of the islands. For example, the 1778 landing of Captain James Cook in Waimea effectively introduced Hawaii to the western world. The official color of Kauai is purple and the flower is the mokihana. Buildings cannot be taller than a palm tree. Kauai grows more taro than any other island in the State. Many local people love taro, and for many newborn babies in Hawaii, it is their first food. Taro root can sometimes grow deep shades of purple, the official Island color. Hanapepe town, is Kauai’s biggest little town and art capital of the island. Kilauea Lighthouse, along the island’s northern coast, is a historic scenic lighthouse and wildlife refuge. The Na Pali Coast is famous for its jagged, mountainous coastline that can only be accessed by hiking, sea tour or helicopter. The endangered Hawaiian green sea turtles choose several beaches in northern Kauai as their preferred nesting grounds. Waimea Canyon, definitely a place to visit on Kauai vacations. 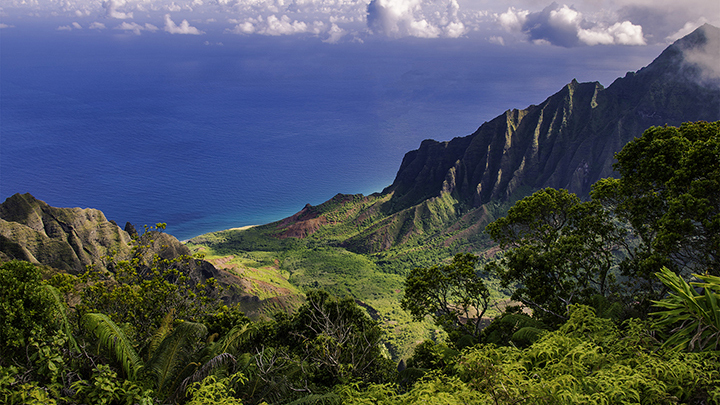 Kauai is the northernmost major island of the Hawaiian Islands. This makes it one of the most isolated inhabited land masses on the globe. It is also the oldest of the major Hawaiian Islands. The east side of the island features Nounou Mountain, commonly known as the Sleeping Giant. Here you can also find the Fern Grotto and Opaeka’a Falls, one of the most accessible and spectacular waterfalls in all of Hawaii. Kauai’s first sugar mill was founded in 1835 and can be visited on the Koloa Heritage Trail. This trail explores the historic vibrancy of Kauai, while reflecting the modern multiculturalism of the inhabitants today. Koloa Heritage Trail covers 14 historical and geological sites. It includes Koloa town, where you can see the Tree Tunnel of eucalyptus trees planted a century ago. Here, you can also find beautiful Poipu Beach Park, which was once voted as America’s best beach. Some of the oldest artifacts from ancient Hawaii originate in Kauai and date as far back as 200 AD. The Kauai Coffee Plantation is the largest of its kind in the United States and is a popular visitor attraction. The west side is the location of the town of Waimea, where famed British explorer Captain James Cook first landed in Hawaii. Koke’e State Park includes 45 miles of the best hiking trails in Kauai as well as Waimea Canyon, the Grand Canyon of the Pacific. 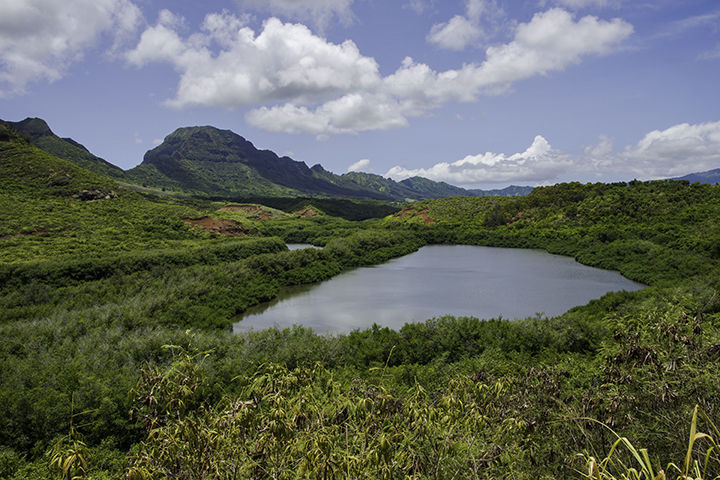 Alekoko Menehune Fishpond is a 1,000 year-old fishpond which the mythical menehune people supposedly built in one night. 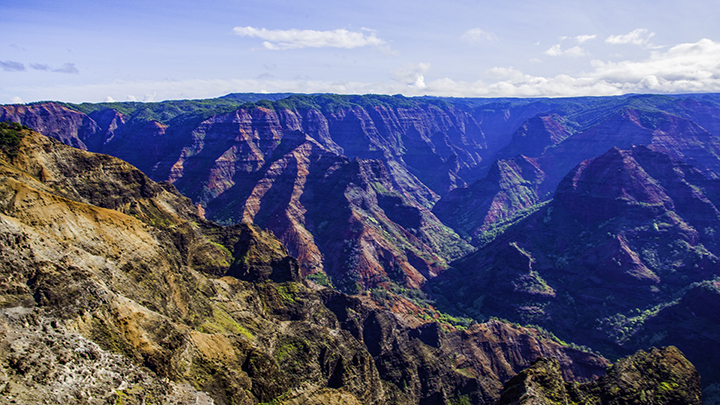 Waimea Canyon and Koke’e State Park feature 45 miles of lush hiking trails and is the home of scenic Kalalau Lookout. The town of Koloa affords you the opportunity to peek into Kauai’s past history. Here, you can visit quaint plantation buildings and shop at stores filled with unique relics and trinkets from the past. Grove Farm Homestead Museum in Lihue highlights the history of sugar harvesting in Kauai. Sugar was, at one time, the main agricultural industry of Hawaii for over 150 years. Kauai Museum in Lihue displays some of the most ancient native Hawaiian artifacts found in the State. It also has some of the best locally produced art. 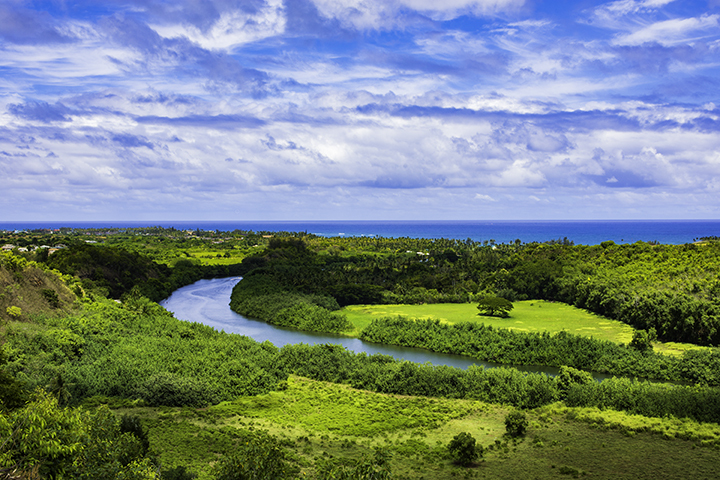 The Wailua River is Hawaii’s only navigable river. Here, you can find many locals and visitors alike enjoying the sport of kayaking. 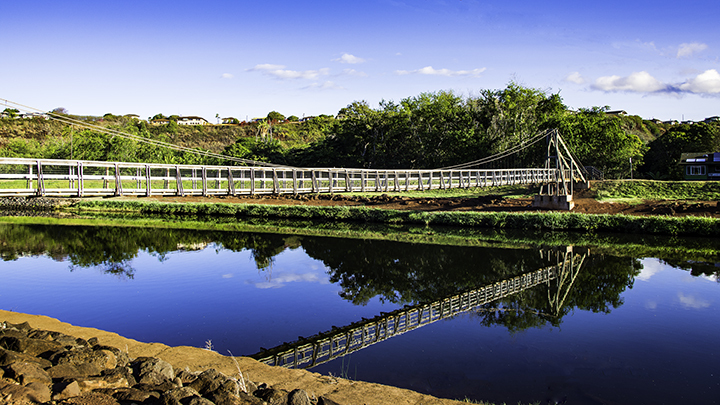 Step into an adventurous journey across some of the famous swinging bridges in Kauai. Some of the most notable are Hanapepe Swinging Bridge, Waimea Swinging Bridge and the Omao Road Bridge. Take a film tour by helicopter or car to visit locations featured in over 60 major motion pictures. 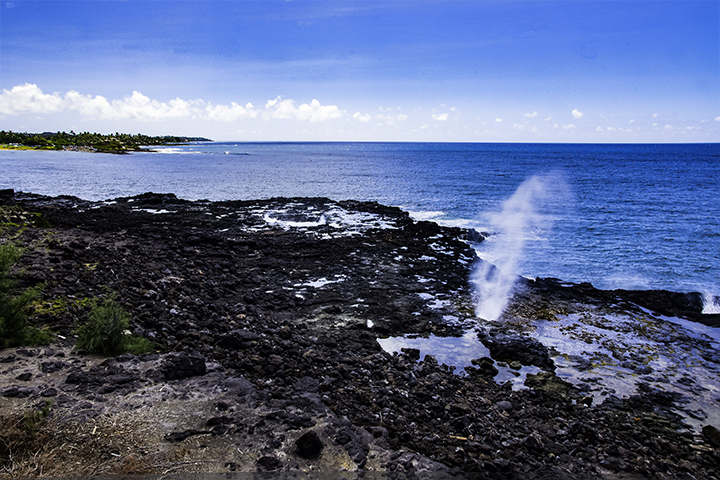 One place you won’t want to miss is Manawaiopuna Falls. It provided the backdrop for the blockbuster movie, Jurassic Park. Unfortunately, you can only view it by air. Any folklore fanatic should visit the mysterious places where the ancient Hawaiian menehune worked on the island. As the legend goes, these people were very small but skillful, with god-like strength. Working only at night, the menehune built many sacred places of worship as well as roads, dams and canals. The origin of these legends remain uncertain. But they have been linked to Marquesan settlers who came somewhere between 200 to 600 AD. Supposedly, you can see their work across Kauai. Such places include the Alekoko Fishpond, the 900-foot wall near Nāwiliwili Harbor and the Makaweli Quarry in Waimea. Activities on Kauai are virtually endless for those who enjoy the great outdoors. The diverse cuisine in Kauai has influences from Polynesia, Japan, China, Portugal, the Philippines and more. You can find anything from sashimi (raw fish slices, typically tuna) to kalua pig (roasted and smoked shredded pork), lilikoi (passion fruit) and papaya. But you can’t go to Kauai without trying some of the locally grown taro. The leaves of the taro plant are dark green and nutritious. While its root, in the form of poi, remains a popular local dish traditionally featured at luaus. Other traditional dishes include tako poke (octopus), lomi salmon (a mix of diced tomatoes, onions and salted salmon), and haupia (a custard-like coconut dessert). Other local dishes that are eaten almost every day include saimin (Hawaii’s version of ramen), Spam musubi, and teri-burgers (hamburgers marinated in teriyaki sauce). For tips on great restaurants and food tours on Kauai, be sure to check out our detailed Culinary Tours page.